32 Inch x 37 Inch Width x8 Inch Deep Artificial Boxwood Hedge Limited UV Protection-Wire Frame. 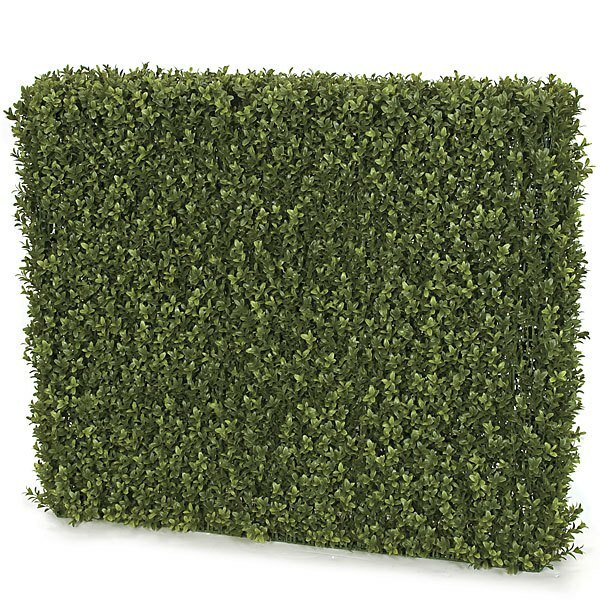 Great for creating a privacy Hedge Wall in Garden. If you are in need of something to make an outdoor garden more private, then you should think about getting a hedge topiary plant. They have an amazing ability to bring color, brightness, and life while walling in the space. That's the case even for artificial plants, and they have the hardiness and durability to last as long as you want to keep them. That makes them perfect for the home garden. They are just what you need to put the finishing touches on a garden, and their variety makes them compatible with nearly any possible design. There are many benefits to having a plant in your garden. First of all, they are easy to place. The plants come in nearly any size as well as many different shapes. Furthermore, although they usually come with wire frames, you can put them on wall installations or even hang them from an existing fence. That gives you a lot of flexibility in terms of how and where you can put the plant. It might not seem like much, but that kind of freedom is essential, because it means you will have a much easier time getting a plant to fit into an existing space. For example, if you have been working with your garden for a long time and do not have the versatility to move things around, then you can get a smaller hedge and attach it to the fence wherever in a convenient gap. When it comes time to select the type of plant you want to acquire, there are many options. The box topiary is one of the most popular large plant options. The foliage is beautiful. It has a small, rounded leaf with a deep primary green that is on the darker side, but there is significant variation in the leaf color throughout the plant. That gives it some pleasing contrast and makes the visuals of the plant far more interesting. Boxwood hedge topiary plants are also easy to shape into unusual forms in addition to their beautiful and varied coloring. That makes them very attractive for the aesthetics alone. Adding a plant can revitalize any space, and they are sure to boost your mood. The ease of fitting the plant into the space when you consider the different possible mounts just makes them even more attractive. You should look through the offerings to see if there is any hedge plant that looks like it would fit best into the space you have at hand. It might be one of the best design investments you ever make, considering how long these plants can last and what they bring to the garden in terms of personality, privacy, and color. The right plant will make the garden more enclosed and add shade, and will be excellent conversation pieces and design accents.